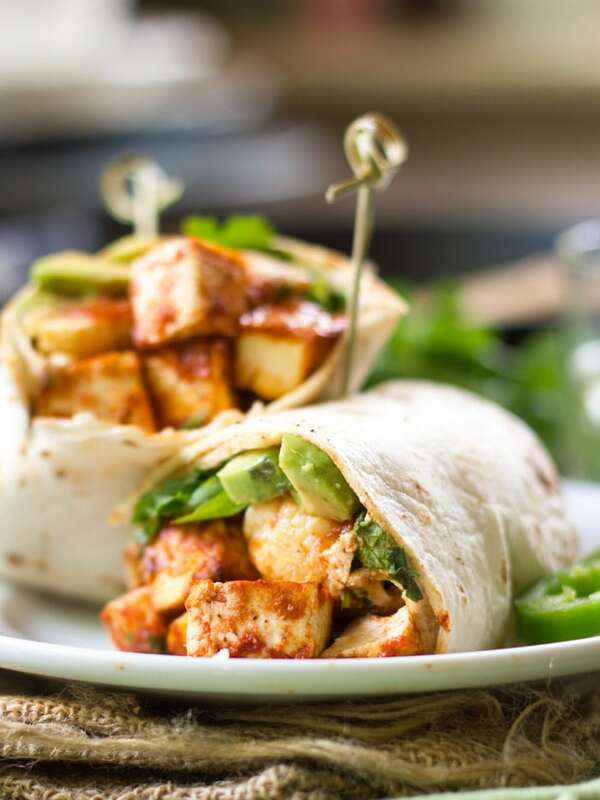 These hearty cauliflower tofu burritos are filled with creamy avocado slices, garlicky roasted cauliflower and baked tofu, all smothered in spicy tomato sauce. Fries. Pizza. Today, burrito. I totally didn’t do this on purpose. This is shaping up to be what looks like the junkiest food week in the history of this blog. How’s that for a resolution? It’s totally not though. These are all healthy versions of my favorite, typically unhealthy, foods. Anyhow, on to tofu burritos! It’s really hard to take a picture of a burrito and make it look cool. Just thought you’d like to know. Most of what you see when you look at a burrito is tortilla, and tortillas, while very useful in the kitchen, aren’t that fun to look at. You come to realize this after planning out and cooking a meal and dreaming about how pretty all the colors and textures will be, only to realize they’re gonna get covered up by a boring-to-look-at old sheet of flat bread. I just gave up and decided to display my burrito in it’s unwrapped form. And this burrito did have some pretty fillings. I always like the way cauliflower looks in photos, so I decided to bare it all. I got better at taking pictures after first publishing this post, so I redid them. This burrito looks way better now, if you ask me. The fun thing about burritos is that you can put anything in them, and while I’m normally into good old refried beans, I really wanted something hearty and healthy. That, and I really like turning on my oven these days. What can I say? My house is drafty. This tofu burrito actually requires only the oven for cooking, and that makes me feel better. Somehow a meal of multiple components seems easier if you’re just using the oven or stove top. Use both and suddenly things are complicated. So I decided to go with the oven on this one, and two of my most oven-friendly fillers – cauliflower and tofu. The result was a toasty house and a batch of the heartiest and most flavorful burritos I’ve ever had. This post originally published on Connoisseurus Veg on a freezing cold January 8, 2015 (hence all the oven talk). 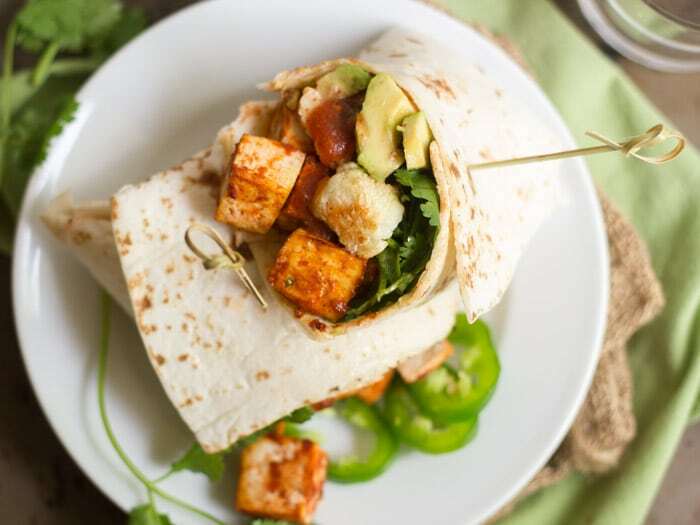 These hearty cauliflower tofu burritos are filled with creamy avocado slices, garlicky roasted cauliflower and baked tofu, smothered in spicy tomato sauce. Preheat oven to 400º. Line a baking sheet with parchment. Stir tomato sauce, cilantro, hot sauce, cumin, ancho chile powder, salt and pepper together in small bowl. 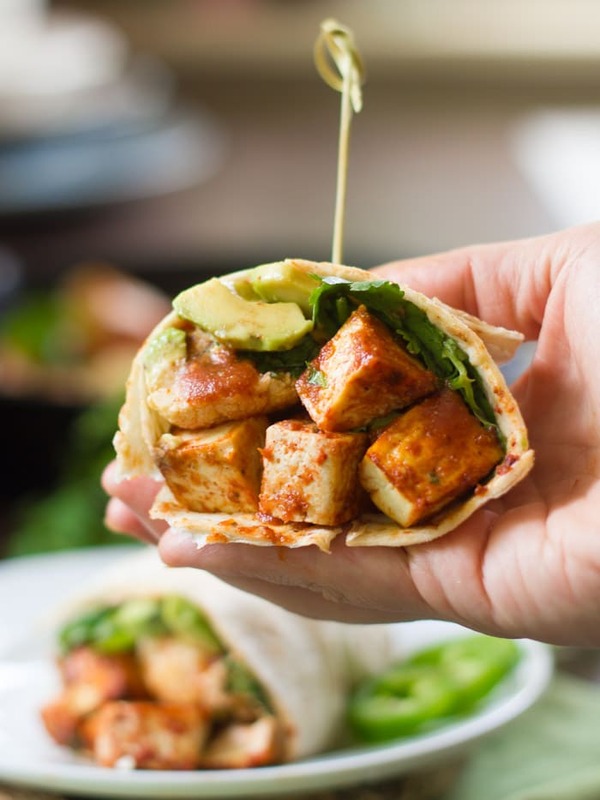 Divide avocado slices, tofu, and cauliflower among tortillas. Top with reserved sauce, fresh cilantro, and scallions. *While you can skip the hot sauce if you aren't into spicy, I'd suggest adding a splash or two of vinegar in it's place, as the hot sauce adds some acidity. Roasted cauliflower is always a hit in my kitchen and I love the idea of the tofu baked with the spicy tomato sauce. Combined with the fresh avocado and the scallions it must be so good! I totally know what you mean about burritos being hard to photograph! I think you’ve made them look delicious here though, especially with that avocado peaking out. I often have to shoot recipes twice, sometimes three times, to get them right so extra work on this one definitely paid off! This was incredible! One of the tastiest things I have ever made. I also roasted a red pepper and 1/4 an onion with the cauliflower and added the tiniest smidge of sour cream. That tomato sauce is genius!! I’m not even a vegetarian and I made this, and it was sooooo delicious! Thanks for the recipe! I Love Roasted Cauliflower and Spicy Baked Tofu Burritos. I’ve never seen anything like this before. I can already imagine how wonderful and crispy they taste. 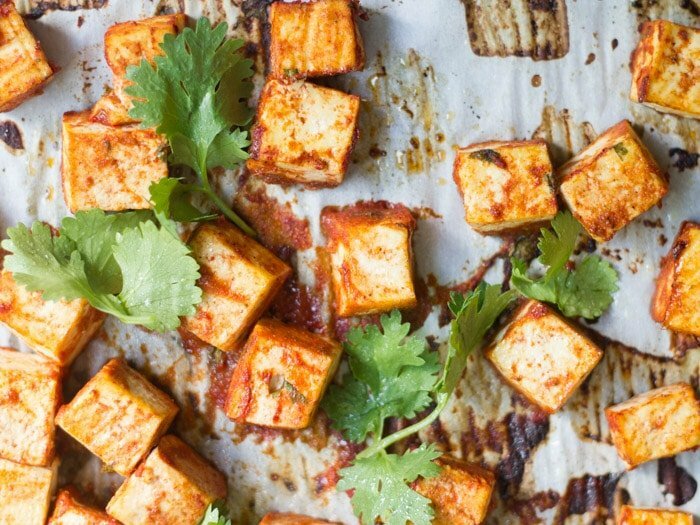 These look really good and would I’ve never thought of doing tofu fries. Thank you for sharing. This recipe is outstanding! Thanks for sharing the delicious recipe. Yay! I’m so glad it was a hit! Thanks so much Angela!